The Training Providers Forum 2018 will be held on Monday 28 May at the Perth Convention and Exhibition Centre. The 2018 Forum will commence with an optional breakfast and guest speaker at 7.00 am, and progress to the day program of plenary sessions and workshops. The day will finish with a networking event between 5.00 pm and 6.00 pm. 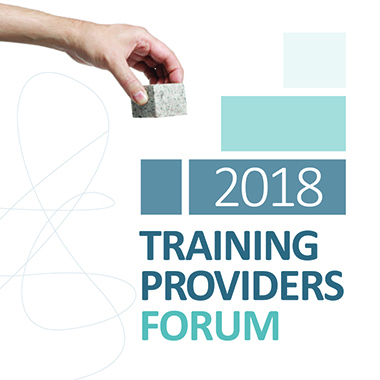 In 2018, the Training Providers Forum program will include presentations by award-winning students, a discussion panel, a selection of information sessions and workshops addressing the themes of the Forum. The plenary discussion panel will present and discuss views on The world of work is changing – Reshaping training to meet future skill needs. The full program is now available, with information on all of the concurrent workshops and presenters. phone 08 6212 9713 or email us. As a sponsor of the Training Providers Forum 2018, your organisation will receive exposure to the VET sector in Western Australia during the event through this website and our newsletter – VETInfonews. About 300 delegates will attend, from private training providers and TAFE colleges, Industry Training Councils and Skills Service Organisations, schools, universities, government agencies and others involved in the VET sector. There are currently two types of sponsorship packages available, those being at $2,000 and $2,500. At the 2013 Forum we introduced coffee carts with dedicated baristas that served coffee to delegates throughout the Forum. The carts were extremely popular and provided a great place for networking. As a coffee cart sponsor you will provide one of these carts. There are two coffee cart sponsorship opportunities available. your logo on the coffee cup. The networking event held after the formal program closes has proven to be extremely popular with delegates and presenters. It is the perfect opportunity for sponsors to network with delegates in a relaxed environment. Networking drinks and canapes are served at the end of the day. displaying a free standing sponsor banner in the registration area. If you are interested in becoming a Forum sponsor, please email the conference ​organisers at tpforum@dtwd.wa.gov.au. Training Providers Forum 2018 will be held at Perth Convention and Exhibition Centre, located in the heart of Perth city and adjacent to the Swan River. The location of the PCEC provides quick and easy access by car, train, bus, taxi and on foot. There are approximately 5,000 parking bays within a 10 minute walk of the PCEC. For more information on getting there, parking, and buses, trains, taxis and ferries, please visit the PCEC website for details. With its convenient location in the Perth CBD, the PCEC is close to many hotels. Information about nearby accommodation is available on the PCEC website.